After-hours return chutes are located near the entrance of both Libraries for your convenience. - 2 weeks for DVDs, CDs, magazines. - 4 weeks for books, audio books and language kits. - A fee is charged for overdue items. Fiction, Non-Fiction, Magazines, Newspapers, Graphic Novels, Large Print, Audio Books, DVDs, Blu-Ray, CDs, eBooks, eAudio Books, eMagazines, Online Databases and more. Free internet access for members is available via our PCs and Wi-Fi network. If you are under 18, permission from a parent of legal guardian is required. It's free to join the library! Your ID and signature are all that is required. If you are under 18, parental or legal guardianship ID and signature are required. Click here to register online. Mitcham Library Service customers can now use any public library across SA with a single card and have access to over 4 million items. Loans can be renewed in person, on the phone or via the catalogue if not overdue. Items can be renewed twice, unless reserved by another borrower. 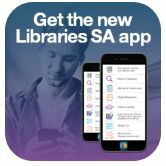 You can reserve most items from any library in South Australia through our online catalogue. When items are available to collect you can be notified by SMS, email or post. The self-check kiosks are your one-stop-shop for borrowing, returning and renewing your loans. Staff members are always happy to assist. All local government employees are bound by the Code of Conduct for Council Employees. To learn more about your privacy as a user of the One Card Network please click here.